Elected Mayor of Watford, Peter Taylor, will present the petition to Sadiq Khan and TfL on 6th September. 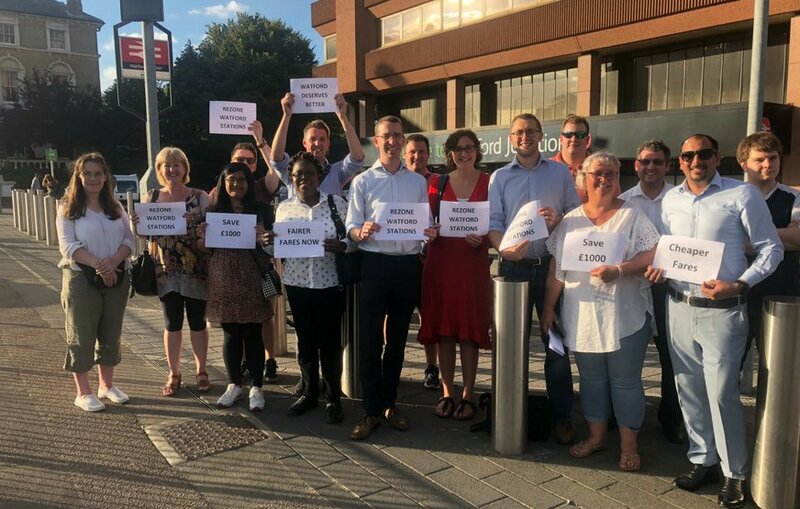 Together with Cllr Ian Stotesbury and the Watford Liberal Democrats, Peter Taylor is calling on Transport for London (TfL) and Mayor of London, Sadiq Khan, to rezone Watford Junction, Watford High Street, Bushey and Carpenders Park stations to Zone 6. The change would make journeys into London much cheaper for local commuters. "Right now we're getting a raw deal in Watford when it comes to how much local commuters fork out in train fares," said Ian Stotesbury, Liberal Democrat Councillor for Callowland. "We're paying as much as £1000 a year more than commuters in Epping, who live further our of London. I want Watford to be moved into Zone 6, a change that would make our fares cheaper and put money in the pocket of local commuters." Commuters in Epping reportedly pay £1,000 less a year, due to being situated in Zone 6. Some Watford stations, such as Watford High Street and Bushey, are marked as being in Zone 8, despite being closer into London than Epping. So far, the petition has over 4000 signatures, and will be open until it is presented directly to Sadiq Khan on 6th September.